Go to original pattern for design DROPS 123-10. Knitted DROPS waistcoat in ”Nepal” with cables. Size S to XXXL. 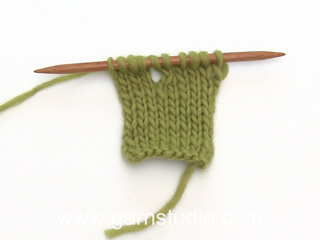 DROPS STRAIGHT NEEDLES size 5 mm / US 8 – or size needed to get 17 sts x 22 rows in stockinette st = 10 x 10 cm / 4'' x 4''. 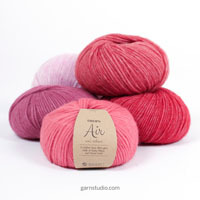 You can get the yarn to make this pattern from	27.30$. Read more. See diagrams M.1, M.2 and M.3 - pattern in diagram is shown from RS (Row 1 = WS). Dec from RS inside 3 garter sts towards armhole and 5 sts garter st towards neck. Dec as follows AFTER 3/5 sts: slip 1 st as if to K, K1, psso. Dec as follows BEFORE 3/5 sts: K2 tog. Make buttonholes on right front band. 1 buttonhole = K tog 3rd and 4th st from mid front and make 1 YO. SIZE S: 3, 10, 16, 22 and 28 cm / 1 1/8",4",6 1/4",8 3/4" and 11". SIZE M: 3, 10, 16, 23 and 29 cm / 1 1/8",4",6 1/4",9" and 11 3/8". SIZE L: 3, 10, 17, 23 and 30 cm / 1 1/8",4",6 3/4",9" and 11 3/4". SIZE XL: 4, 11, 18, 24 and 31 cm / 1½",4 3/8",7",9½" and 12 1/4". SIZE XXL: 4, 11, 18, 25 and 32 cm / 1½",4 3/8",7",9 3/4" and 12½". SIZE XXXL: 4, 11, 19, 26 and 33 cm / 1½",4 3/8",7½",10 1/4" and 13". 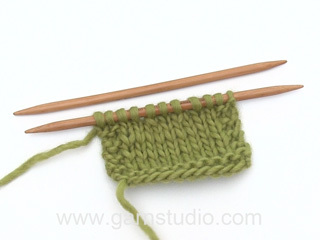 Cast on 76-84-92-100-108-116 sts (includes 1 edge st each side) on needle size 4 mm / US 6 with Nepal. K 3 rows. Work next row as follows (from RS): 1 edge st in garter st, K 14-17-20-23-26-29 sts, * K2 in each of the next 2 sts, K1, K2 in each of the next 2 sts *, K 36-38-40-42-44-46 sts, repeat from *-*, K 14-17-20-23-26-29 sts and 1 edge st in garter st = 84-92-100-108-116-124 sts. Change to needle size 5 mm / US 8, and work next row as follows from WS: 1 edge st in garter st, P 5-8-11-14-17-20 sts, K3, M.1 (= 21 sts), K3, P 18-20-22-24-26-28 sts, K3, M.1 (= 21 sts), K3, P 5-8-11-14-17-20 sts and 1 edge st in garter st. Work 2 vertical repeats of M.1, remaining sts with K over K and P over P. After M.1 work M.2 with dec and inc as shown in diagram (work remaining sts as before). REMEMBER THE GAUGE! After M.2 there are 84-92-100-108-116-124 sts on needle. Continue in M.3 over M.2 until finished measurements (work remaining sts as before). When piece measures 37-38-39-40-41-42 cm / 14½''-15''-15¼''-15¾''-16 1/8''-16½'' work 4 rows garter st on 7-8-9-10-11-12 sts each side (includes edge st), then bind off the first 4-5-6-7-8-9 sts each side for armhole. 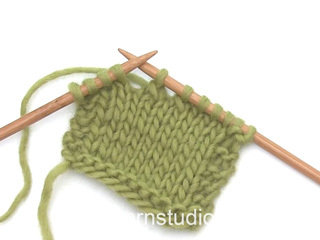 Bind off to shape the armhole – SEE DECREASING TIP – 1 st 2-4-6-8-10-12 times = 72-74-76-78-80-82 sts on needle. Continue in pattern as before with 3 garter sts each side towards armhole. When piece measures 55-57-59-61-63-65 cm / 21 5/8''-22½''-23¼''-24''-24¾''-25½'' work 4 rows garter st on the middle 24-26-28-30-32-34 sts, then bind off the middle 14-16-18-20-22-24 sts for neck and complete each shoulder (= 29 sts) separately. Continue with 5 garter sts towards neck. When piece measures approx 58-60-62-64-66-68 cm / 22¾''-23 5/8''-24 3/8''-25¼''-26''-26¾'' dec 4 sts evenly over M.3 = 25 sts left on needle. On next row bind off with K over K and P over P.
Cast on 43-47-51-55-59-63 sts (includes 1 edge st at the side and 5 front band sts towards front edge) on needle size 4 mm / US 6 with Nepal. K 3 rows. Work next row as follows (from RS with start from the side): 1 edge st in garter st, K 14-17-20-23-26-29 sts, K2 in each of the next 2 sts, K1, K2 in each of the next 2 sts, K 18-19-20-21-22-23 sts and 5 front band sts in garter st = 47-51-55-59-63-67 sts. Change to needle size 5 mm / US 8, work next row as follows from WS: 5 front band sts in garter st, P 9-10-11-12-13-14 sts, K3, M.1 (= 21 sts), K3, P 5-8-11-14-17-20 sts and 1 edge st in garter st. Work 2 vertical repeats of M.1, remaining sts with K over K and P over P. Then work M.2 over M.1 (with remaining sts as before). After M.2 there are 47-51-55-59-63-67 sts on needle, Continue with M.3 over M.2 until finished measurements (with remaining sts as before). AT THE SAME TIME when piece measures 30-31-32-33-34-35 cm / 11¾''-12¼''-12½''-13''-13 3/8''-13¾'' work 2 rows back and forth on the 5 front band sts only. Continue on all sts as before – AT THE SAME TIME on next row from RS dec 1 st towards neck – SEE DECREASING TIP, and repeat the dec on every other row a total of 7-8-9-10-11-12 times and then on every 4th row 5 times for all sizes. AT THE SAME TIME when piece measures 37-38-39-40-41-42 cm / 14½''-15''-15¼''-15¾''-16 1/8''-16½'' work 4 rows garter st on the 7-8-9-10-11-12 sts towards the side, work remaining sts as before. On next row bind off 4-5-6-7-8-9 sts at the side for armhole and bind off to shape the armhole as described or back piece. When all dec for armhole and neck are complete there are 29 sts on needle. 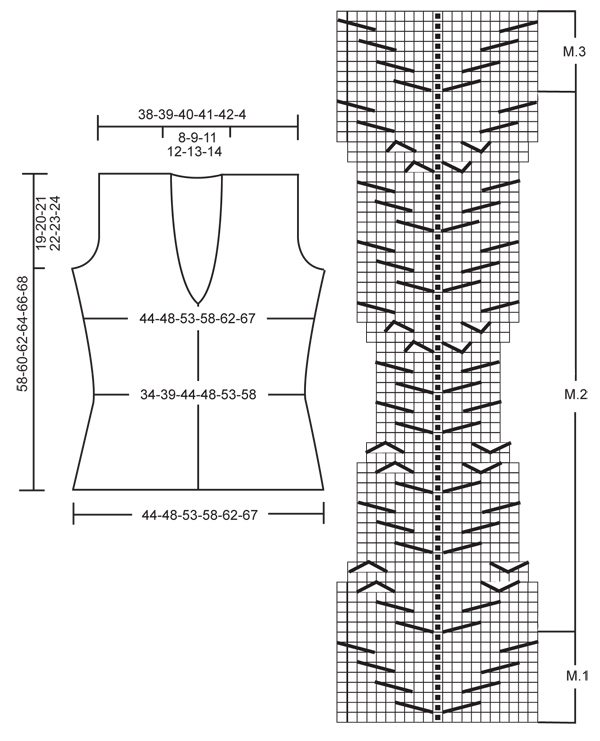 Continue in pattern with 3 garter sts towards armhole and 5 garter sts towards neck When piece measures approx 58-60-62-64-66-68 cm / 22¾''-23 5/8''-24 3/8''-25¼''-26''-26¾'' dec 4 sts evenly over M.3 = 25 sts left on needle. 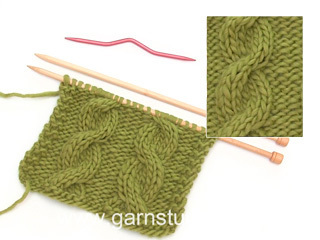 On next row bind off with K over K and P over P.
Like left front piece but mirrored. Remember BUTTONHOLES on front band – see above. Sew side seams inside 1 edge st and sew shoulder seams. 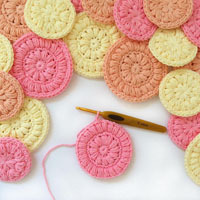 Sew on buttons. Die Beschreibung für den Ärmelausschnitt ist etwas zu kompliziert. Habt ihr eine bildhafte Beschreibung oder ein Video dazu? Dear Mrs Javaid, when piece measures 37-42 cm (see size), you will prepare armholes working 4 rows garter st over the 7-12 sts on each side, then bind off 4-9 sts on each side and dec on each side to shape armholes - while continue working in pattern as stated. Happy knitting! In der Anleitung bricht der Text zur Fertigstellung ab: Die Seitennaht zusammennähen. Die Schultern ......? Wie geht es mit dem Halsausschnitt weiter? Die Anleitung wurde gerade ergänzt. Der Halsausschnitt ist fertig, so, wie er ist, es fehlte eigentlich nur noch, dass die Schultern zusammengenäht und die Knöpfe angenäht werden müssen. Viel Spaß beim Tragen! Hola Virginia. ¿Podrías concretar, por favor, dónde ves tu el fallo en el diagrama? Gracias. Sehr schöne Weste! Hab sie für meine Oma gemacht. War in einer Woche fertig. Die Wolle lässt sich wirklich toll verarbeiten! Hoi Martine. Dat klinkt hartstikke leuk! Maar we kunnen helaas niet helpen met individuele aanpassingen op de gratis patronen. Je kan eventueel een patroon hier vinden met zakken en dat aanpassen in dit patroon. Succes en veel plezier. Die Anleitung ist jetzt angepasst. Vielen Dank für den Tipp.